The Unicode Consortium today released version 10.0 of the Unicode Standard. 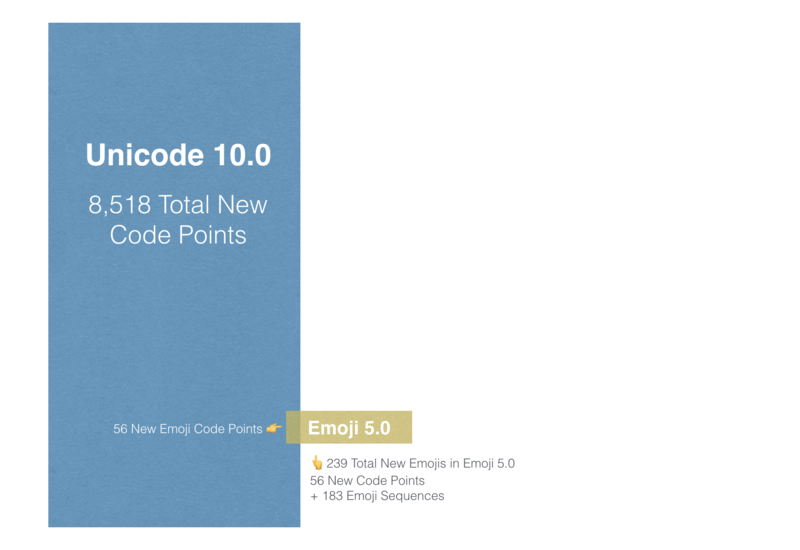 This means that the code points required for new emoji support are now considered final, and stable to be included in updates from major vendors such as Apple, Google, Microsoft or Samsung. TL;DR: The Unicode Standard now includes two dinosaurs, the Bitcoin symbol, and the long-awaited Colbert Emoji. Above: Sample Images for new emojis. Image: Emojipedia. "Unicode 10.0 adds 8,518 characters, for a total of 136,690 characters. These additions include 4 new scripts, for a total of 139 scripts, as well as 56 new emoji characters." 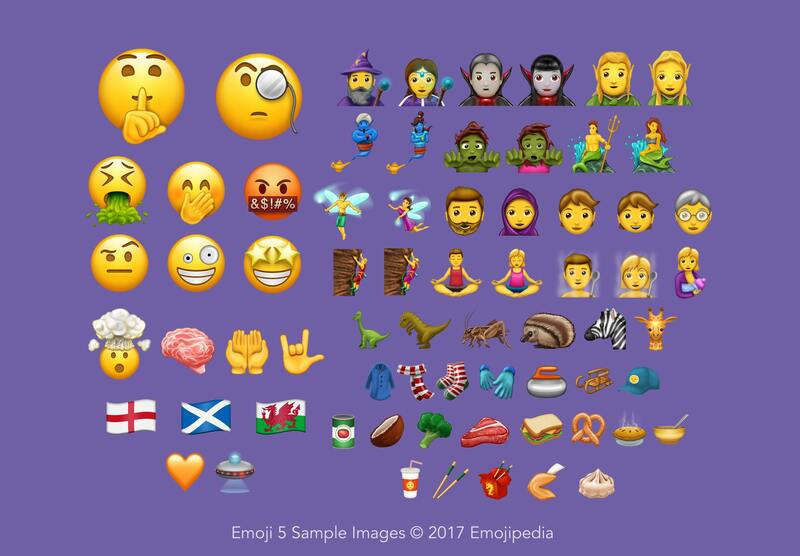 The 56 code points needed to create the 239 new emojis in Emoji 5.0 make up a relatively tiny proportion of new characters in this release. Emoji sequences for flags, genders, and skin tones don't require additional code points. From the emojis above, only the base character for gender or skin tone is listed. Flags for England, Scotland and Wales are part of Emoji 5.0 and not shown here as they don't require new code points. Above: The relationship between Unicode 10.0 and Emoji 5.0. Image: Emojipedia. The final emoji list for 2017 was announced in March; with the code points required for many of these now final. Vendors have had a few months notice on which emojis are final, and with the release of Unicode 10.0 are now clear to include support in any future software updates. Other popular additions include Giraffe, Dumpling, Mermaid, and people with a beard, hijab, and breastfeeding. 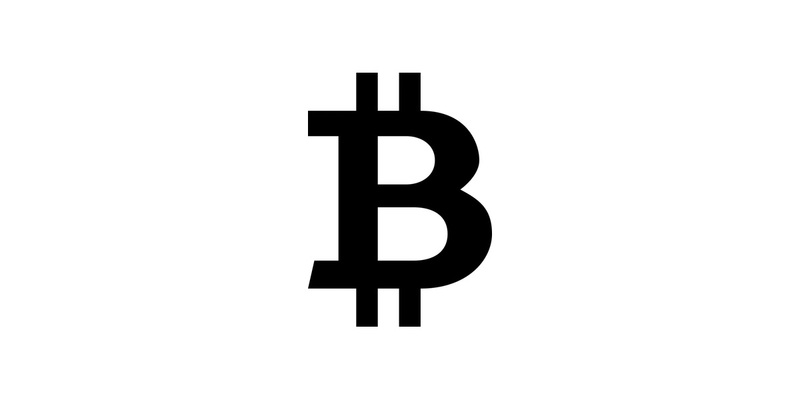 Bitcoin symbol is a regular Unicode character, and not an emoji. Unicode 10 also adds support for "lesser-used languages and unique written requirements worldwide". Unicode 10.0 was been released June 20, 2017. The details are available now. Vendor updates for these new emojis will vary, with most companies likely to include support in the second half of 2017. Google revealed their new emoji support in the first beta of Android O, and Twitter added support during the Unicode 10 beta period. Above: New emojis from Unicode 10 in Android O beta. Apple generally updates iOS with new emoji support in September-December each year. This often comes as part of a point update to a major iOS release, such as iOS 9.1 or iOS 10.2. Facebook is also testing new emoji support for some users. Sign up to our free newsletter Emoji Wrap for the latest emoji news, first.